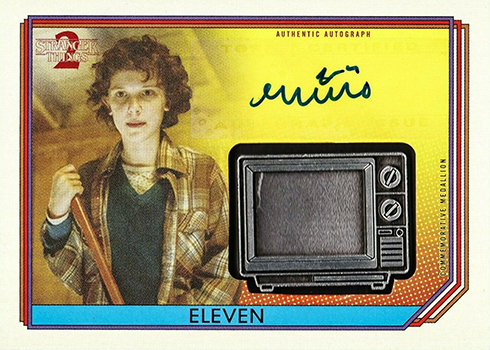 Jump to the 2019 Topps Stranger Things Series 2 checklist. 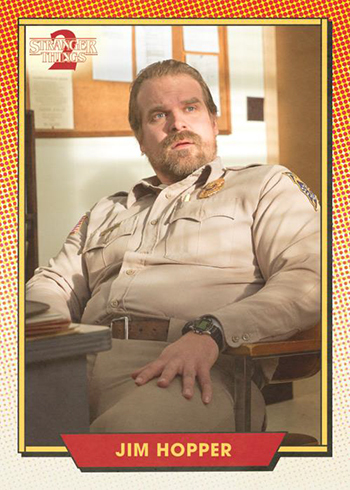 2019 Topps Stranger Things Series 2 trading cards delve into the Netflix series’ second season. 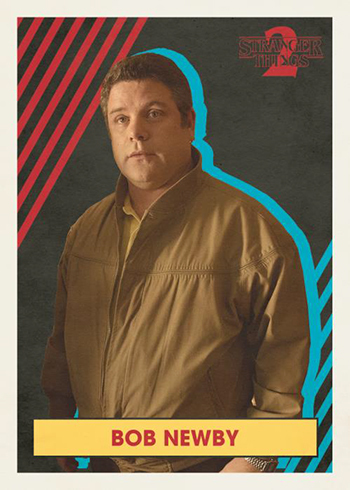 That means more monsters, more ’80s hairstyles and more Sean Astin. For the most part, the overall configuration lines up with the first season’s set but many of the of the designs see added elements and lots more color. 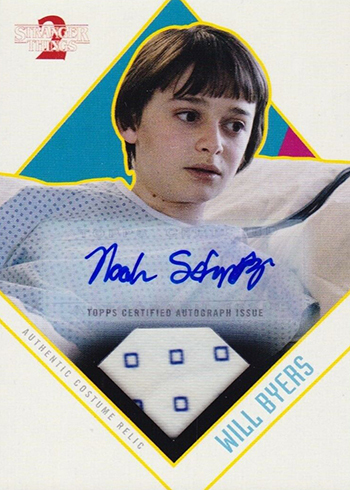 Hobby boxes promise a pair of premium inserts. 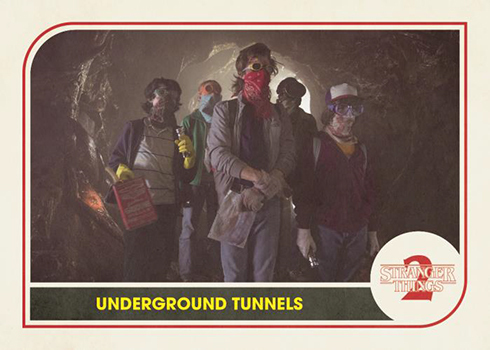 The first is guaranteed to be an autograph or sketch card. Costume relics, manufactured patches and medallion cards join them for the second hit. The main set summarizes season two over the course of 100 cards. The design is slightly different this time around, although it carries a complimentary vibe. Parallels are relatively limited starting with Upside Down, which have 99 copies each. Waffle parallels are numbered appropriately to 11. Illustrated Art and Printing Plates are all one-of-ones. 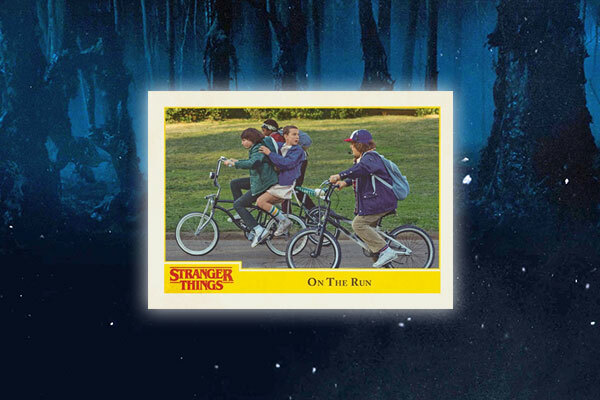 2019 Topps Stranger Things Series 2 has the same basic inserts again. 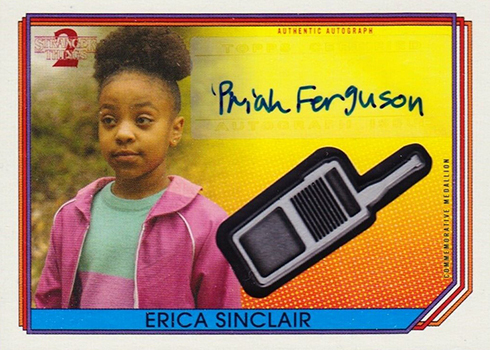 Character Stickers, Scene Stickers and Character Cards all have 20 cards on the checklist. 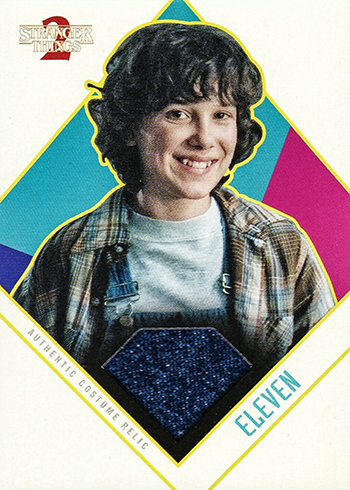 These are much more colorful this time around, particularly the Character Stickers, which have a definite ’80s aesthetic to them rather than riffing off of old Topps stickers. Autographs feature signatures from the show’s stars. Besides base versions, there are Orange (/99), Green (/50), Purple (/25), Blue (/10) and Gold (1/1) parallels. 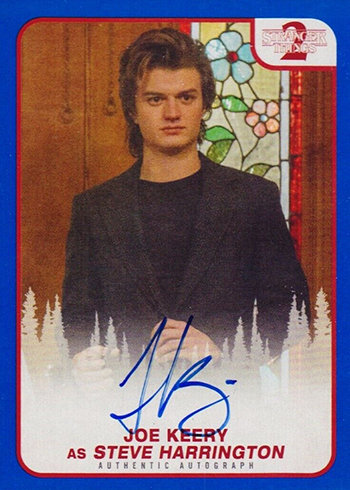 Dual (/10) and Triple Autographs (/10) are also available. 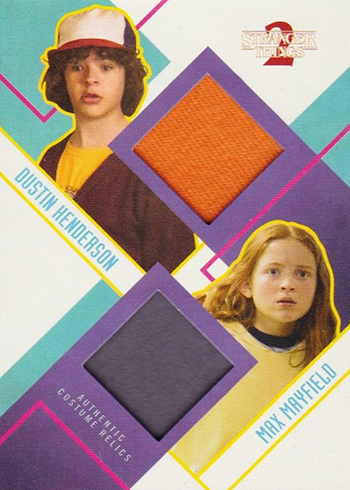 Relics use swatches of costumes from the show. These have several parallels: Orange (/99), Green (/50), Purple (/25), Blue (/10) and Gold (1/1). 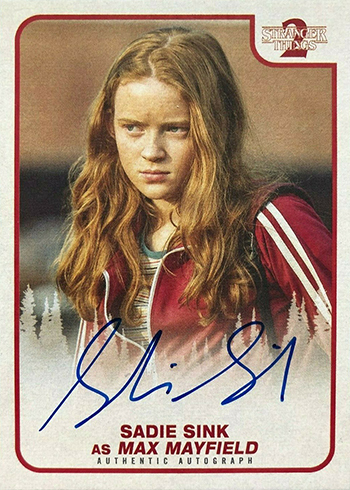 Autograph versions of select cards have ten copies each. 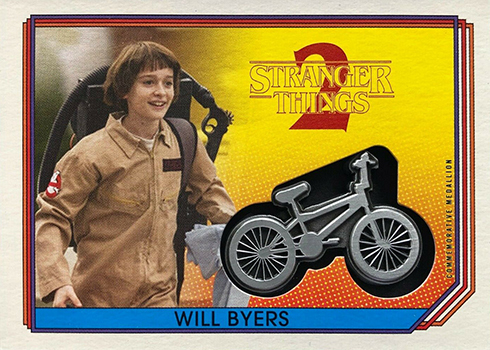 Manufactured relics come in two forms for 2019 Topps Strangers Things Series 2. 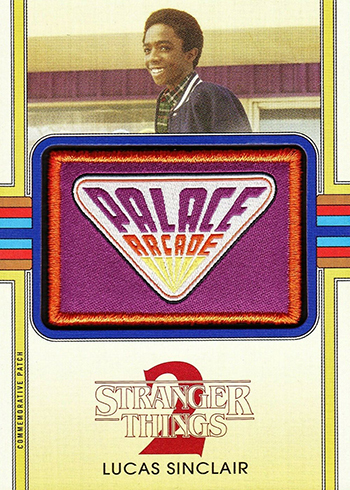 Commemorative Patch cards return. Joining them are new medallion cards. Both of these have the same parallel levels as the costume relics, including autographs. 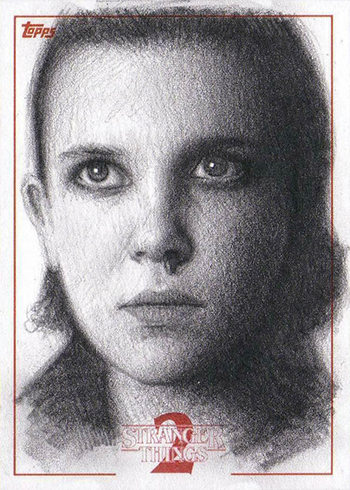 Sketch cards have original art done directly on them. 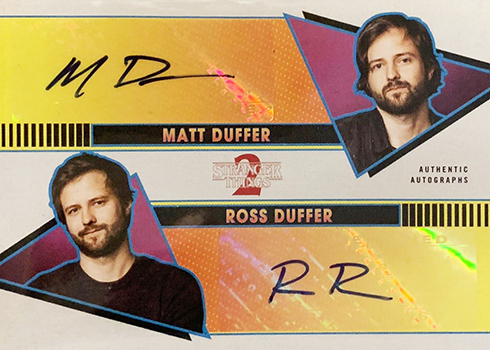 Shaped Sketch Cards are a new addition to the checklist.